The Divider content blocks emphasize breaks or transitions between sections of content. 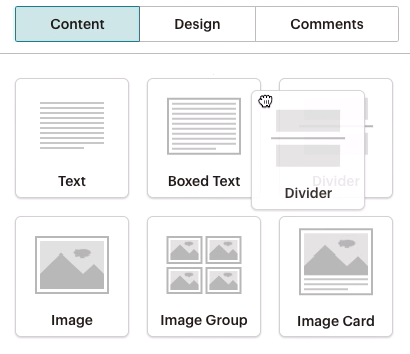 Use the Divider content block to visually separate other content blocks in a campaign. Divider lines can run only horizontally between content in your layout. In this article, you'll learn how to use the Divider content block. To insert and edit the Divider content block, follow these steps. On the Design step, click and drag the Divider block into your campaign layout. Great! You’ll see a straight gray line between the content blocks of your design. To make changes to the divider, click the Style tab. On the Design step, click and drag the Divider block you want to edit. Change the style for the content block in the Style tab. 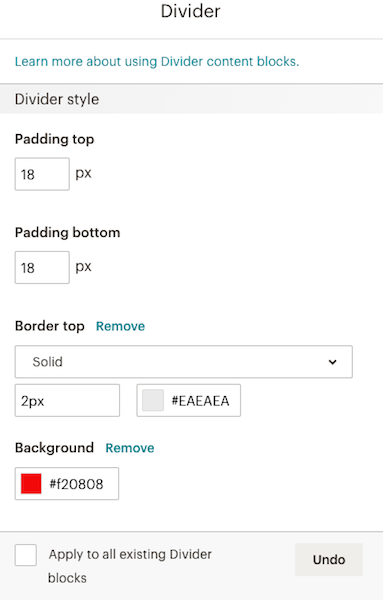 To add or remove padding, or space, above and below the divider line, type in the amount of pixel space you want in the Padding Top and Padding Bottom fields. To style the divider line or increase the thickness from the 1 px default, use the drop-down menu and fields under Border Top. In the Background field, choose an optional background color for your Divider block. To set this styling for all Divider blocks in your campaign layout, select the Apply To All Existing Divider Blocks check box. Success! You’ve set up your Divider block. If you’d like to know more about the other types of Content Blocks you can use, we have a full list of Content Block Types.